Buying a house is expensive. You put all of your available cash into a down payment, closing costs, moving costs, and tons of expenses that you probably didn’t expect (how did we miss that none of the windows had blinds!) We closed on our house and put in a new HVAC system the very next day – while still paying for our condo for another month! That really hurt. However, when you move you usually have a lot of excitement and want to work on some projects right away to make the new place more you. Here are seven projects under $100 that you can do right away to make a new house feel more like your home. Paint the walls – this is a biggie! If you are interested in getting into DIY, painting is a great first step. Paint is relatively cheap, it is very straightforward and easy to do, and if it is your first time working on projects with a spouse, roommate, or partner, it’s a great way to learn their crafting style! Paint makes a huge impact giving you a great bang for your buck. Paint the front door – speaking of paint, paint your door. Again, paint is cheap and painting the door changes the exterior look of your house quickly without having to actually paint your house or change your siding. Pick a bold, fun color like we did and instantly let all your new neighbors know that you are here to stay! Hang art – hanging art fills the empty walls and makes the new space feel like yours. Even if you aren’t ready to paint and don’t know exactly what new furniture you’re going to buy down the road, it’s ok to hang art before you’re ready. We had boxes and boxes of art and photos in a closet for six months and then one day said “why don’t we just hang this up?” and it instantly made us feel better about our walk up the stairs. Buy some plants – have an empty corner in your new living room? Buy a tall palm that will fill it up and give you some depth. 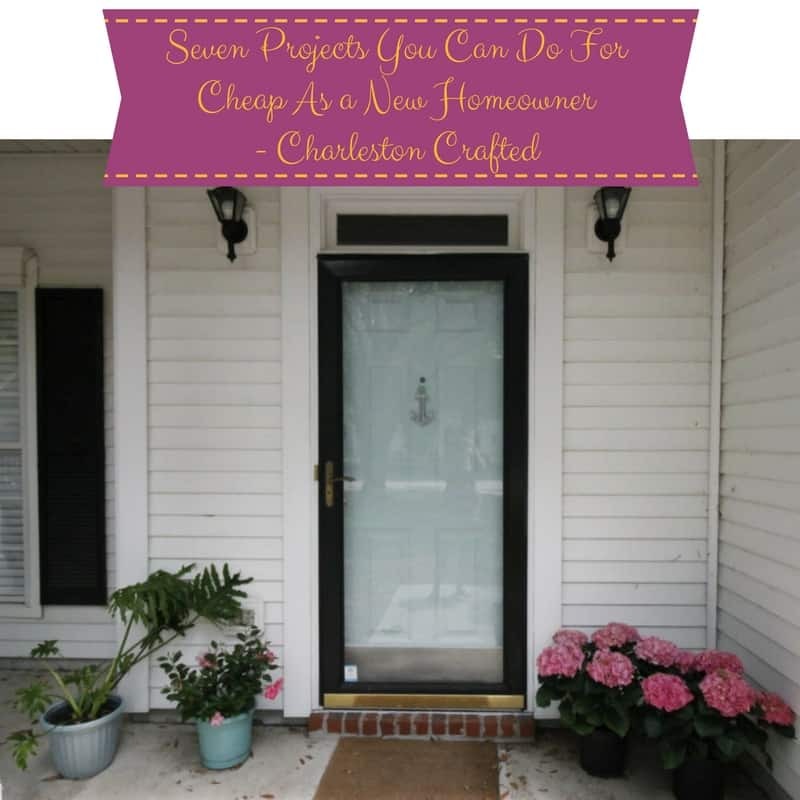 Have a barren front porch? Grab some hanging baskets and some potted plants for either side of the door. Adding a couple of plants inside and out gives you some cheap pieces of decor and make you feel like you’re on top of something. Plant a veggie or herb garden – we moved in too late to start our veggie garden for last year, but if you move in the right time of year, plant an herb or veggie garden in your yard or on your porch. You can go full scale garden or just do a little planter of herbs, but you’ll be putting your stamp on the outdoors and creating something that you can enjoy. We get such a great sense of satisfaction when we eat veggies that we grew ourselves! Upgrade a light fixture – pick just one at first. Take the room that you are spending the most time in and pick out the new light for that room. Or pick the one right inside your entryway that you see first. Again, it’s all about making your new home feel like yours and making you feel welcome in your new home. Light fixtures CAN be super expensive, but they don’t have to be. Buy some new linens – out with the old, in with the new. You’ve probably had your sheets for too long anyways, so buy new ones. You are probably going to have to buy new beds for new rooms as well, so why not just replace the sheets and the towels in the bathrooms? Target has ones that are super cute and inexpensive. When you buy your first home, there will be a lot to take on, but that doesn’t mean you can’t make a meaningful impact right away for not a lot of money. You got this, now go make that home yours! What tips do you have for projects you can do for cheap as a new homeowner?